Manny Ramirez’s positive PED test and subsequent abrupt retirement has caught everyone by surprise. Now that he has been caught twice, it raises the question: did he use performance-enhancing drugs during his entire career? You’d think he had to be stupid or arrogant to get caught again. However, I think he just felt he had nothing lose; he knew wouldn’t serve the 100 game suspension. He actually had a great deal to lose; his legacy and HOF candidacy will forever be tarnished. Most fans know that Manny was a great natural hitter with or without steroids, but he may not have had as much power as he displayed throughout his career without PEDs. For him to be bold enough to get caught again makes one think that he was using for his entire career. 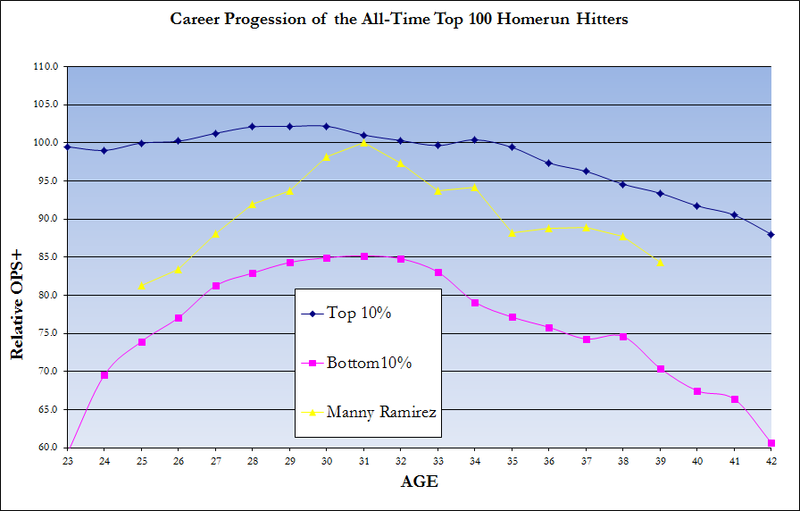 The graph above shows his career trajectory; it usually accurate when trying to detect a steroid user. The primary disadvantage of this method is that it may overlook a guy who used PEDs for his entire career, as it only detects abnormal changes in career trajectory. Consequently, if ManRam did use for his entire career, he slipped through the cracks of an effective detection system. If he used at only certain points of his career, it probably didn’t help him too much. One other possibility is that he starting using around 34 or 35; there was a slight, but significant, increase in the difference between him and the average player at ages 35-38. Bottom Line: He was probably using for most or all of his career.